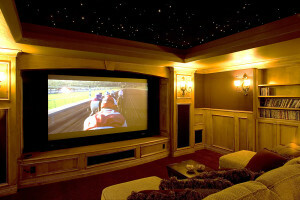 Our solutions for creating the perfect home theaters, media rooms and equipment choices. Home Theaters used to be the province of the movie moguls. No more. The incredible advances in entertainment electronics combined with the explosion of available media content have expanded the Home Theater universe in ways that were unimaginable just a decade ago. Any reasonably-sized room can conceivably be transformed into your own home theater. Electronic Integration’s free in-home consultation, for those of you in a finished home, or their free blueprint consultation, for those of you planning your home, will help you enter this entertaining world. Alternatives for converting any room into a standing or concealed home theater will be presented to you. Screens can drop from the ceiling, speakers may be hidden in the walls or ceiling, and cabinets can conceal fabulous flat-screen televisions as mirrors or artwork that spring to life when turned on. Complete free-standing single-use home theaters are also an Electronic Integration specialty, with dynamic sound, dazzling large-screen displays and even seating that moves with the action. This becomes your own private screening room allowing you to retreat to another world in your home. To help you enjoy your home theater even more, the controls are simplified to enable the entire experience. A single button can dim the lights, reveal the screen, and start the action. Your budget, viewing preferences, room requirements, home design and many other factors are considered in designing your Electronic Integration home theater.